We had such a nice dinner party this past weekend with new and old friends. I’m on a new eating regimen, only allowed 25 carbs every 4 hours/maximum. It is wonderful. I love it… But it posed an interesting problem. How was I going to make delish appetizers, a great meal and a wonderful desert for my dinner party? I think you will see below, we nailed it in style and flair without sacrificing taste and fun. I made two pizzas for a party of 8. Buy a package of big round Finn Crisp. They come 4 to a package. Take one out and put in on a pizza pan. I used the pan to make the pizza, and serve the pizza, but you will actually bake the pizza on the naked wire shelves in the oven without the pizza pan…ok? So, spread tomato paste all over the Finn crisp. Spread a layer of Ratatouille ( I had homegrown/homemade Ratatouille in my refrigerator,) onto the tomato paste layer. Shred and sprinkle about 4 oz. grated mozzarella cheese on top of that. 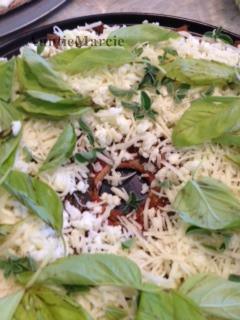 Sprinkle about ¼ c. grated Parmesan cheese on top of that. Now, go to your garden and snip fresh oregano, thyme and basil. Wash it and take it off the stems. Sprinkle those on top of your pizza. Bake your pizza either in your toaster oven on the fresh pizza setting, or in the conventional oven at 375° convection or 400° bake setting until top is bubbly and bottom is crisp, about 12 minutes. Pulse the first three ingredients together in the food processor. I first put in the onion and let the blade shred. Then I added the mayonnaise and parmesan cheese. Mix it and let it sit in the fridge to get cold and thick. Use another large round Finn crisp to spread the mixture on. Bake in a 400 over until golden brown and bubbly on top and crisp on the bottom. Remove from oven and place on pizza pan. Sprinkle top with freshly shredded arugula. The heat will wilt it. The combination is really terrific.